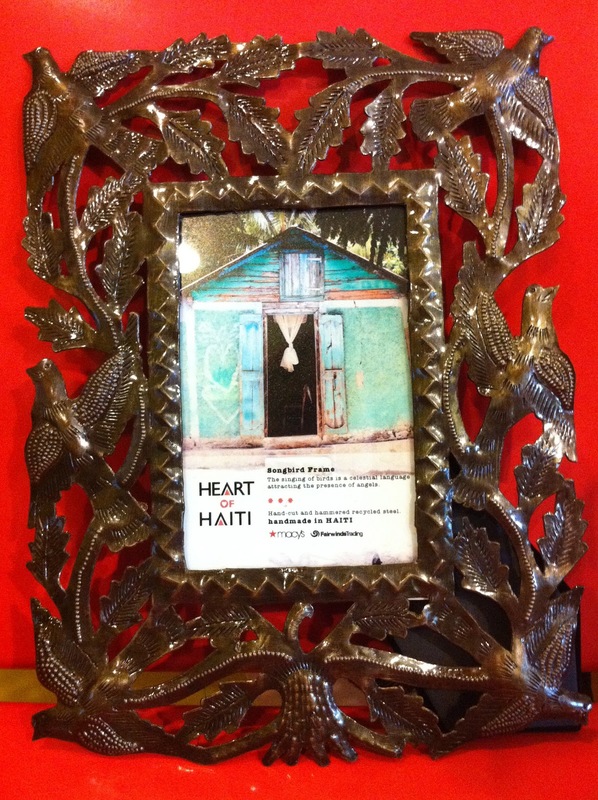 Heart of Haiti is an amazing collection of handmade goods at Macy's that lets you feel good about shopping. Not just because you have fabulous taste– which is obvious, dahling!– but also because the Haitian artisans who create the collection receive half of the wholesale price from each piece. This initiative, a partnership between Macy's, Fair Winds Trading and the Clinton Bush Haiti Fund, allows the artisans to foster self-sufficiency and helps them to become an important part in rebuilding the economic infrastructure of Haiti. Much of the Heart of Haiti collection is steeped in folklore and tradition, so showcasing it in select Macy's stores nationwide makes the artisans de facto cultural ambassadors for their country. I hate the term "win-win" but it definitely fits, in this case! I have long been a fan of folk art and handmade goods, so I was really excited to be asked to review an item from the Heart of Haiti collection. They have a wide selection of jewelry, sculpture, housewares and textiles so it was hard to choose one thing! I remembered an intricately carved firescreen in a magazine years ago (before I had kids…) and being impressed that something so ornate and delicate could be made from repurposed steel drums. Incised metalwork is a craft that has a long history in Haiti so I decided to choose the Heart of Haiti Songbird Picture Frame for my review. In person, it is even more lovely than I had hoped. Choosing a photo to encase in this frame was hard! I didn't know if I should use it on a snapshot or a Gocco print from my collection. I decided I would put one of my favorite pictures of Roo in it, showing her as a toddler, leaning against one of her daddy's big wooden sculptures. 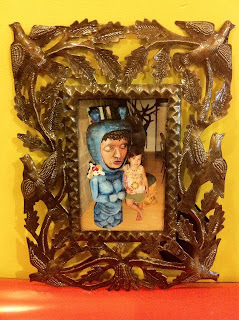 It seemed to strike a nice balance between art and home life, what do you think? I love the way it looks against my chartreuse office walls! See more videos on the Heart of Haiti site at Macy's about metal working, painted wood and papier mache artisans. In accordance to the FTC Guidelines and the WOMMA Code of Ethics, I am disclosing that I received the frame pictured above to facilitate this review, which is part of a Fair Winds Trading/Heart of Haiti awareness campaign by Everywhere. Rest assured, however, that all opinions are– as usual– entirely my own. Wow, that frame is gorgeous. And I think you chose exactly the right picture for it. It would probably still be sitting empty at my house because I would be stymied by what to put in it. I got the horn stretch bracelet from the Heart of Haiti collection and it is gorgeous. I can't wait to wear it out on Saturday night! What a terrific initiative. 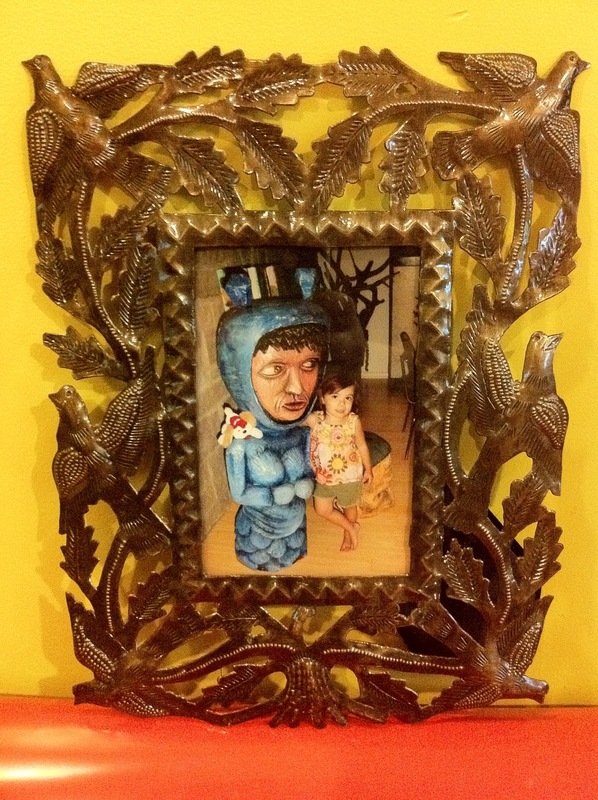 What an intricate, creative frame. I love seeing all the handiwork, and I really like the photo you chose to use inside it. The frame looks so pretty. I got the cow horn bracelet from Heart of Haiti and it's gorgeous. I love it. What a terrific initiative.